A New England ski operation—the Berkshire East Ski Resort—has fully embraced green energy, installing both wind and solar power over the last several years, and is now the first ski resort in the world to be completely powered by on-site renewables. Picture a ski resort. Do you see the lifts? The snow? The lodge? Now add a solar power facility and a wind turbine, and you've got the Berkshire East ski resort. The Schaefer Family, owners of the Massachusetts ski resort, initially installed a wind turbine and have now added solar power to the mix. In fact, it's said that Berkshire East is the first ski resort in the world to be completely powered by all on-site renewables. The ski resort installed a German-manufactured PowerWind 56 900-kW turbine in 2010. Though PowerWind has since gone on to supply turbines on other projects in New England and the Midwest, Berkshire East was its first project in the U.S.
David Strong, senior project manager of Sustainable Energy Development Inc. (SED) of Ontario, New York, was involved in the construction of both projects and says that there was already talk about a solar project as the wind turbine project was wrapping up. "The end of construction for the wind turbine dovetailed nicely into the design phase of the solar power project," says Strong. The 540 kW solar project was different in many ways, starting with financing. 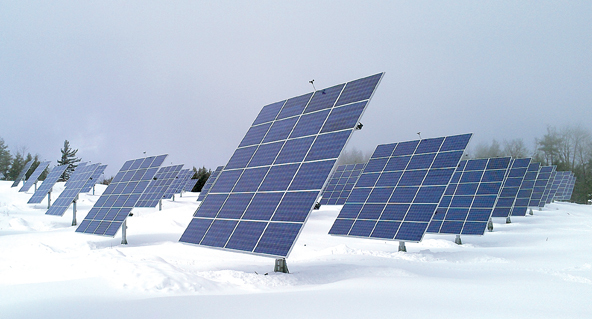 Unlike the turbine, the ski resort did not intend to own the solar farm, so the resort owners executed a power purchase agreement (PPA) with Vermont-based AllEarth Systems. The solar project and the PPA were important to the Schaefers because energy is one of their biggest expenses, especially in the winter months. Solar offered guaranteed costs, allowing the resort freedom from the ups and downs of energy market prices and the ability to better manage future costs and improvements—like the resort's new zip line, which offers one of the longest zip line canopy tours in the U.S.
"I don't think investments like the zip line are possible unless you can have some certainty of your expenses long term. The solar and wind projects at Berkshire East are particular examples of being able to quite literally fix your electricity costs for ten to 20 years," says Strong. The site of the solar project was chosen in collaboration with SED and the Schaefers. "The Schaefers were the driving force behind the general project area," says Strong. "The micro-siting was left up to us and our design team. We had the general tracker layout, and we optimized that layout after the full civil work began." The civil engineering turned out to be one of the biggest challenges; the subsurface conditions in western Massachusetts are far from ideal for solar and the necessary foundations. "The surface is a challenging combination of relatively shallow boulders and soft earth," explains Strong. "It's the type of terrain where short of doing 90 geotechnical borings—one at each exact spot—you couldn't comprehensively characterize the subsurface conditions. We had two or three different anchoring methods, and we also had to adjust based on the actual drilling attempt." Adding to the challenging topography, construction took place primarily in the dead of winter on one of the resort's hilltops. It began in the late fall of 2012 and wrapped up in April 2013. The same civil challenges they had with installing the foundation hindered site access. "We waited for a really good break in the weather, and then we did a big mobilization," says Strong. "We put all of our workers out on site and got all the panels installed in a short timeframe during November and December. We got it done right before the snow hit." AllEarth Renewables supplied the 90 dual axis AllSun trackers. "Because the system is tracked, you get more power generation over the year—and for this particular project, it was just the best technology for the site," says Strong. "Another good thing about the trackers is that they have an algorithm that can be triggered to dump the snow." In addition to the trackers, 2,000 BYD solar panels were selected, as well as SMA 6000-US SunnyBoy inverters. SED was also able to use a lot of local services. "We not only used the ski resort's services—general maintenance services that they provide—but also local electricians, local civil contractors, and regional suppliers for all the foundations. So we were able to keep a lot of the benefits of the construction phase of the project right within that area. It's something we always try to do," says Strong. Another hurdle was the utility interconnection process, which isn't uncommon, says Strong. "Whenever we interconnect a distributed generation system, the utility is allowed to pass on the costs that they need to protect their system," says Strong. "In the last couple of years, utilities have taken a more standardized approach to many of these distributed generation projects. What that has done, in some cases, has been to force upgrades, like real time monitoring with dedicated remote trip systems, on to smaller projects that don't necessarily need them. "These are expensive standalone communication systems that are typically required for larger generation projects, in the 10 to 20 MW range. Unfortunately, because the utilities are now trying to standardize some of the smaller projects of this size, it's occasionally arbitrarily applied to these size (540 kW) projects." Strong says the burden of proof that the projects won't have a large impact on the utility's system is often paid for by the proposed company; those studies can be extensive for a small to mid-size project, and sometimes can even turn out to be unnecessary. Unfortunately for SED there wasn't a reliable precedent which the utility could look to. "They were developing their standards as they went," says Strong. "It takes extra time." The local utility was, however, able to keep costs down, in part because of the minimum demand on the circuit and the complementary nature of the wind and solar. Despite the hurdles and the construction challenges, the 540 kW facility project came in on budget and is producing at or above expectations. This kind of project doesn't work unless the owners do their homework, says Strong. In this case, the Schaefers took it upon themselves to learn what would work and who to partner with to achieve it. But, Strong adds, it's a two-way street. SED also had to learn a lot about ski resorts—everything from their electrical profile to snowmaking. "I think you have to have a company like Sustainable Energy Development that specializes in these renewables to integrate the project. We make it very seamless for them. We had to know how to integrate the construction schedule and not interrupt their bread and butter operations. They are focused 100 percent on providing good services," he says. "Good communication was key to ensuring the resort business wasn't impacted by construction." The Berkshire East project was a good fit for SED from the start. Their ideal customer is a privately owned business that has a large electricity expense related to their operations. "A self-owned renewable energy project can really fix a company's costs and provide that certainty for the long-term," says Strong. "It's really a struggle for these folks to predict how much to budget year after year because of volatile electricity expenses—particularly in places with a lot of manufacturing. Even commercial facilities and universities that use a lot of electricity are great candidates for a self-owned renewable energy system." It's not just privately owned businesses SED looks to. Many towns are now under net metering rules. "A town can own or lease property to a private owner under a power purchase agreement. Or they can self-own or even purchase power from a large solar facility. The town can then pass the actual electricity or the savings directly on to the folks in the town. That's an attractive business model." For the Schaefers, adopting renewable energy was in line with their mission. Not only was it good for their image, it was also critical for them to stay in business long-term. Strong says he is seeing this kind of decision making in other companies too. 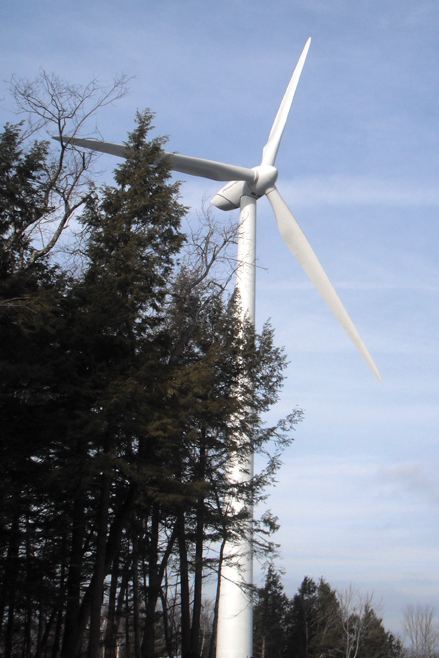 For instance, an industrial plastics injection molding facility recently installed turbines much like Berkshire East's turbine. "This company is well-known for their leadership in sustainability and they're aiming to be zero carbon, and they're making good progress," says Strong. "Even in a classic energy-intensive manufacturing space like plastics, their forward-looking, sustainable attitude has allowed them to stand out in their field and lock in a customer base. "The corporate responsibility, the long-term visionary outlook, depends upon a sound environment, whether you are a ski resort or a company that makes plastic parts. These companies realize that for folks to keep going on in a healthy economy you can't trash the environment. They play a central role in the effort to reach economic sustainability." Strong adds that these projects must all be based on sound economics; otherwise any project is an uphill battle. "But just because economics is the first thing, that doesn't mean it will always translate to a successful project. "What I've found personally is that you need to have a project champion in the organization. A committed person that can go to their local representatives—whether it be the town or the county—and help get approvals. They can go and line up the financing if they need to." That champion will typically spearhead the project and provide the organizational momentum to see the project through. "That determination to do the project and an understanding of the whys behind the project beyond the economic benefits—to me, that has been a common denominator for the whole project." For the Berkshire East solar facility, the Schaefers were that champion. In part, because of the partnership they forged with SED, the ski resort will be operational for many years to come.